Universal Orlando Water Park On The Way? Orlando Attractions Update – According to ThemeParkInsider.com Universal Orlando Resort has begun work on a new water park, codenamed “Project 533,” to go on a 33-acre site south of the Cabana Bay Beach Resort. Last August, Universal trademarked the name “Wondersea Island” for a water park development, and the plans for the new park include “slides and pools plus various recreational facilities. A tall ‘volcano’ with slides will be constructed in the southern portion of the site,” according to documents filed last Friday with the South Florida Water Management District. Universal owns the Wet ‘n Wild water park located across Interstate 4 from the main resort property. 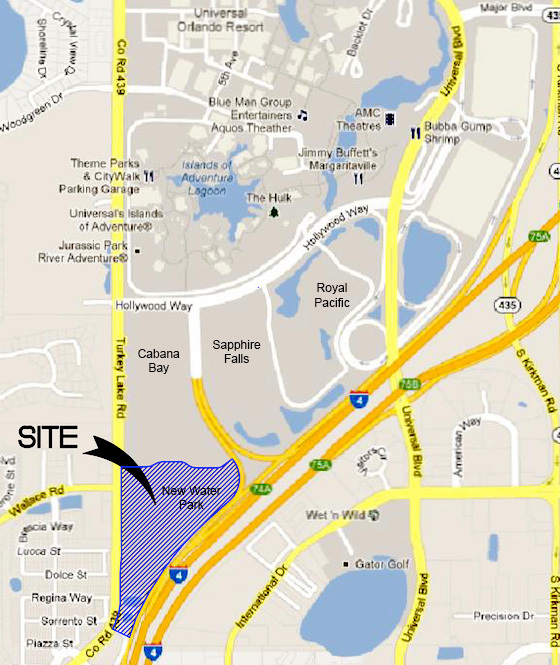 But the new park would be located adjacent to the Cabana Bay and upcoming Sapphire Falls resort, in a much more convenient location for on-site Universal Orlando hotel visitors. In a best-case scenario, the new Universal Orlando Water Park will draw more visitors than Wet n’ Wild, but it won’t come close to drawing even a third of the visits that one of Universal Orlando’s theme parks will. It won’t drive attendance to the resort the way that Harry Potter has. But a well-designed, conveniently located water park might help Universal Orlando Resort entice more of the people who come to visit its theme parks to stay — and spend — just a little bit longer. And that is why theme parks build water parks.